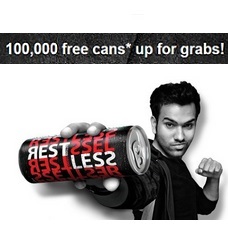 Get 2 Restless Action Drink Free Cans. It comes loaded with herbal ginseng, Vitamin C and essential salts, apart from the usual B Vitamins, taurine and caffeine. The natural energy of Ginseng, the goodness of Vitamin C, and the replenishing powers of active salts such as Sodium & Potassium add to the health quotient, positively charging you to get more action out for your life. Free can offer valid in Ahmedabad, Bangalore, Baroda, Bhopal, Chandigarh‎, Chennai‎, Coimbatore, Delhi/NCR, Goa, Guwahati, Hyderabad, Indore, Jaipur, Kochi, Kolkata, Lucknow, Ludhiana, Mumbai, Nagpur, Pune, Surat, Visakhapatnam. 3. Enter to get your free pack.